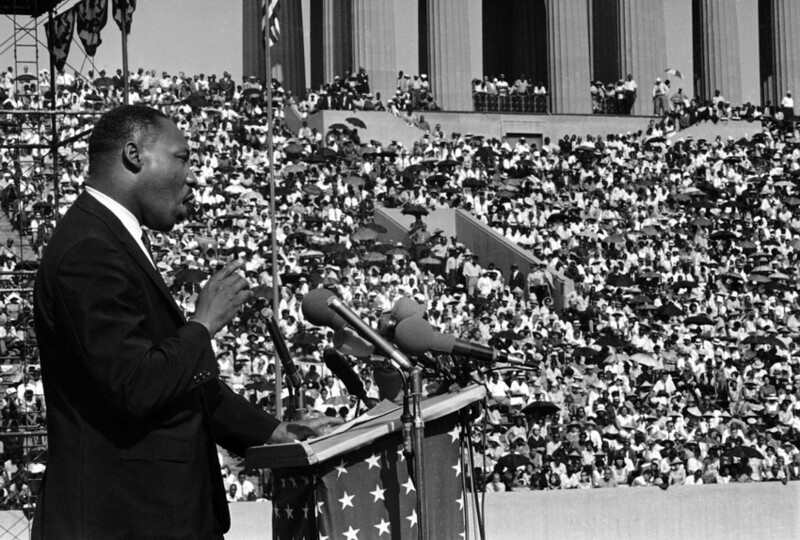 Dr. Martin Luther King addresses a crowd estimated at 70,000 at a civil rights rally in Chicago’s Soldier Field in 1964. And so, we celebrate Martin Luther King Day, a big holiday for furniture sales and discounts. Depending on where you live, you may be able to take advantage of MLK discounts at Broyhill, La-Z-Boy, Ethan Allen and American Mattress. In 1964, Dr. Martin Luther King Jr. won the Nobel Peace Prize. In 1966, he came to Chicago. Someone threw a rock. It struck King on the head. He fell to one knee. He stayed on the ground for several seconds. As he rose, aides and bodyguards surrounded him to protect him from the rocks, bottles and firecrackers that rained down on the demonstrators. WELCOME TO CHICAGO . . . RICHARD J. DALEY, MAYOR. But it was Daley who gave us Dr. Martin Luther King Jr. Drive, yes? It happened like this. When the Democratic National Convention was on its way to Chicago in 1968, Daley was not, as one might think given the way things had turned out, concerned about the war protesters and other long-haired “agitators” expected to come to town. One forgets that the people he most feared might upset the convention were blacks. His paranoia was fueled by the devastating West Side riots that had taken place earlier that year in the wake of the April assassination of Dr. King. So it was decided that police would pressure black militants and gang members, arresting some and hassling others, getting across the “behave or else” message. But Daley’s savvy dictated a less aggressive maneuver, and on August 1, 1968 the City Council met to placate the black community by renaming a street in honor of King. The meeting was remarkable with one administration Alderman after another eulogizing King as a great man, forgetting that they had assailed him when he was alive. Daley himself described his relationship with King as one of great friendship and mutual understanding, claiming that King had told him what a fine job he was doing for the city’s blacks. The street selected for the name change was South Park Way, which ran through predominantly black sections of the South Side. There were suggestions that the street chosen cut through the whole city (Western Avenue, perhaps), but Daley wouldn’t listen. He knew that in white neighborhoods street signs would be defaced or destroyed. So that is how South Park Way became Dr. Martin Luther King Drive. And today, in Dr. King’s honor, Sears has 50 percent off mattresses and Kmart is offering free shipping.